Blitz Build is an accelerated annual construction effort that brings the community together. It is open to all community volunteers, businesses, organizations and builders willing to partner with Habitat for Humanity-Spokane. 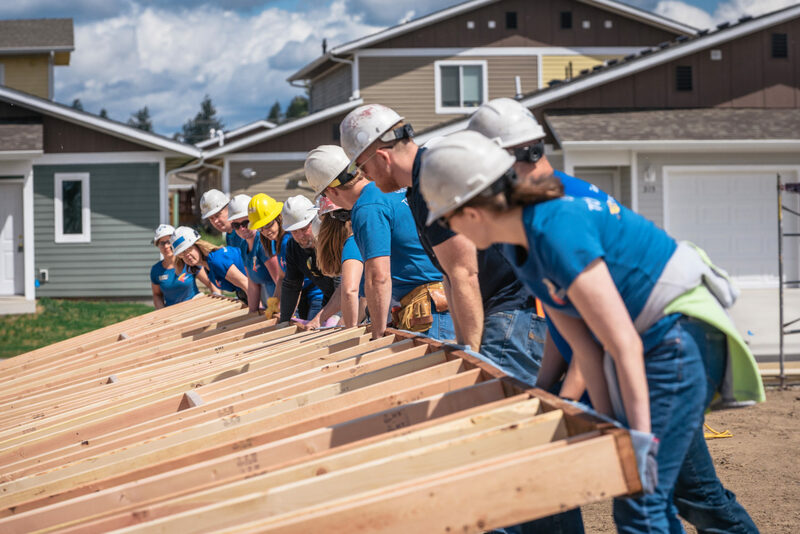 Together, several hundred skilled and unskilled community volunteers, sponsor groups, and current and future Habitat homeowners will work side-by-side to build decent, affordable homes for families in need in Spokane County. Habitat for Humanity-Spokane has been “Blitz Building” for 17 consecutive years. Every year Blitz Build attracts hundreds of volunteers throughout Spokane community as well as high media attention. For more information about Blitz Build, please contact Lydia Duffy at lduffy@habitat-spokane.org or by phone at (509) 534-2522. Sponsors of Blitz Build will get first selection of volunteer slots available. Volunteer signup will be available to all members of the public two weeks prior to the event. If you would like to register yourself or your company/organization to volunteer, please contact Colleen Weedman at cweedman@habitat-spokane.org.